Remember all the stories a few months ago forecasting that Banks would depress real estate prices by listing lots of “Shadow Inventory” in the Denver MLS? While this was true for many large cities in the US, it wasn’t true in the Denver real estate market. First, let’s define Shadow Inventory. Exhibit 1: Shadow Inventory and other types of troubled properties in Denver. Note 1: These are properties that are 90+ days late on mortgage. Source: Your Castle Real Estate analysis, MLS data. Consumer-Owned that is more than 90 days late on their loan. Not actively on the market – a part of Shadow Inventory that has to be sold eventually. Not on the market –the owner is in denial, and the home will eventually become a foreclosure. This is part of the Shadow Inventory. The rest of the article explains how we estimated the size of the Shadow Inventory and what it might mean for people buying and selling Denver real estate. There are three reasons why Denver does NOT have exposure to this problem. Reason 1 – Homes in Denver are more likely to have positive equity and not be underwater. The Denver market has fallen 16% from its peak. Prices have been stable or slightly increasing for three years. Many cities in the US had much more dramatic gains and falls. As a result, if you look at the average equity gain over the last three years, Denver is the best among the largest thirty cities in the US. Las Vegas has suffered the most. Foreclosures are much more of a problem in a market where prices are still declining. 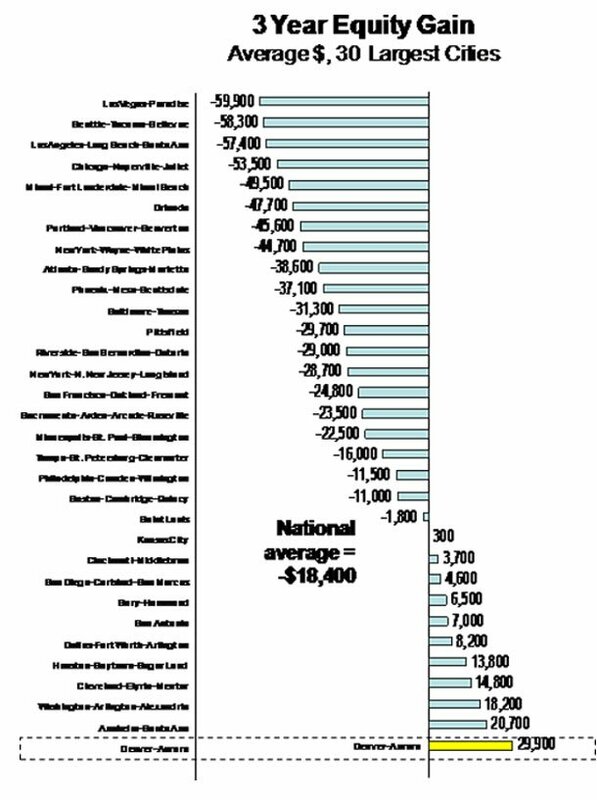 Source: National Association of Realtors, Your Castle Real Estate. Reason 2 – As a result, the number of homes owned by banks is very low in Denver. Because Denver’s home prices didn’t appreciate as much during the bubble and began the correction before most markets, Denver has already processed the majority of its REO (real estate owned by banks) inventory. 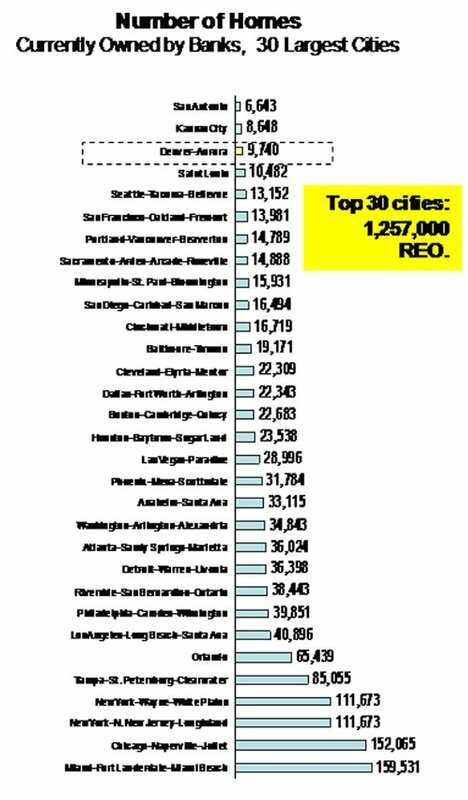 Only San Antonio and Kansas City have smaller REO inventories. Miami has the most REO inventory. Reason 3 – The number of late mortgages in Denver is less severe than most markets. 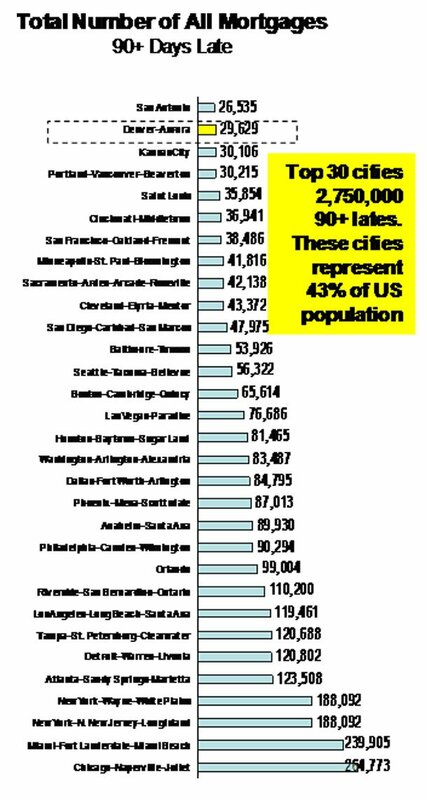 Notice how severe the problem is in Miami, compared to Denver. In Denver, we have about 29,500 homes that are 90+ days delinquent on their mortgages but are still owned by the consumers. What will happen to them? According to NAR (National Association of Realtors), 2500-3500 homes in Colorado receive a loan modification each quarter. We might expect that 10,000 of these delinquent loans are cured by modification. Some of the homes have equity and can proceed thru a normal sales process. That might be another 5,000. Some of the homes do not have equity. Pro-active sellers will conduct a short sale, and avoid foreclosure. That might be another 5,000. Finally, some of the homes will go all of the way thru the foreclosure process. That might be another 9,500. However, it’s just an estimate – it could be anywhere from 5,000 to 15,000. Regardless of the number, these Shadow homes probably won’t hit the market for 3 to 12 months. 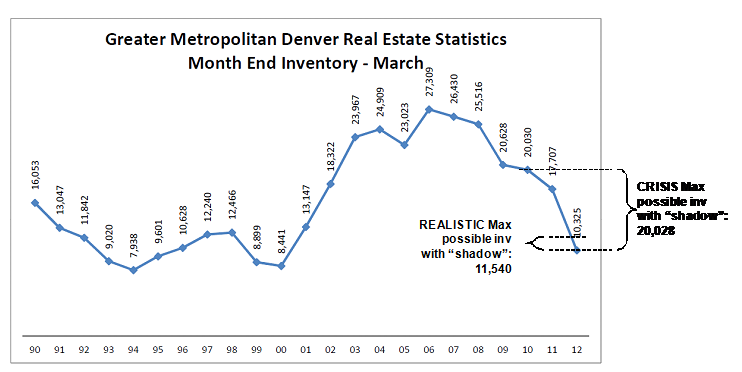 We estimate the total Shadow Inventory to be about 16,000 homes in Denver. The question is: over what time period they be brought to the market? What does it mean for Denver’s Real Estate Market? We don’t think the likely size of the Shadow Market poses a threat to home price appreciation in Denver. Here’s why. Exhibit 4 shows you the average inventory of homes and condos for sale over the past twenty years. You can see that our inventory in 2012 is at the lowest point in about a decade. On a per capita basis, we’re near the lowest inventory we’ve ever had. Of the 9,500 REO properties, we estimate that 3,000 are currently on the market. It’s likely that about 2,000 are under contract and 1,000 are active (and thus in the 10,325 active homes). Among the 29,500 seriously delinquent properties, we’d estimate about 2,000 are currently listed as short sales and are pending approval from the banks. Another 1,000 are active on the market. If you review Exhibit 1, there are 16,000 Shadow Inventory properties. We estimate these properties will come to market over the next twelve months – around 1,000 per month. In Exhibit 4, you can see how the available inventory would increase in such a scenario. In a crisis situation, we might assume that around half of those troubled homes all get dumped on the market at once. That is the upper line estimate in Exhibit 4. Even in this crisis scenario, you can see this only increases the number of active properties on the market to the level we were at in 2010. This isn’t an issue. We currently have a shortage of inventory at most price points under $450,000. Bringing these homes on the market would be a good thing for buyers – particularly first time buyers, and investors that want to bring rental properties to the market. The Shadow Inventory is a significant problem in many markets – especially Miami, Las Vegas, Chicago, and many parts of Arizona and California. However, in Denver, our housing market never got into as much trouble as these speculative markets – and we’re reaping the benefits now as a result. Great article, Lon, thank you for sharing. The historic low inventory in Denver makes this a GREAT time for any potential sellers to get into the market. One national report put metro Denver’s shadow market at nearly 14,000 homes, relatively low compared to cities that have been harder hit by the recession. It is interesting to note that you are stating your lowest inventory levels in over a decade, Dallas is currently reporting very similar figures which raises the question whether this is the case across the US. If so then it definitely shows demand is there, it would be interesting to note at which price bands the inventory is lowest as Dallas shows the affordable homes below $200,000 as having the highest volume of sales progressing. It shows that now really is a great time for those looking to Sell. There is much being made about the alleged “shadow inventory” of homes being held by banks that are in some stage of foreclosure. Advocates of the “the shadow inventory is ‘out-there-lurking-and-ready-to-dump-new-inventory-on-the-market’ obviously have no idea about the disincentives for banks to do that. In addition to the mistake of perhaps selling too soon into a rising market, banks have a very important reason not to sell their property at a loss. If a bank sells a property at a loss, they must immediately show that loss on their books and every loss affects their stock, their loss ratio and their P&L sheets. Analysts of banks look very carefully at loan loss coverage ratios and it has a major effect on the market reputation of the bank as well as how the investor community sees that bank. This issue was seen during the financial crisis of 2008/09 when many securities held on banks’ balance sheets could not be valued efficiently as the markets had disappeared from them. In April of 2009, however, the Financial Accounting Standards Board (FASB) voted on and approved new guidelines that would allow for the valuation to be based on a price that would be received in an orderly market rather than a forced liquidation. Starting in the first quarter of 2009, banks were allowed to not “mark-to-market”. This ruling fixed an accounting problem which had been causing many banks to appear undercapitalized when in fact they were not. When a bank has to write down an asset on its books, it not only has to take the loss, but also has to beef up its reserve of cash to cover its declining asset base. The net result is a black eye and less money to lend— even if the bank plans to hold the asset until indefinitely or until maturity. So basically, there is no incentive whatsoever for a bank to rush onto the market any properties subject to foreclosure. Those who fail to understand the internal workings of banks are still believing the myth of “shadow inventory” rather than the fact that the FASB accounting rules allow banks to hold troubled real estate assets without having to write down their value. Maybe these “believers” should come out of their own shadows and see the light of day.